click: Search your stack for a non-virus program and install it, lowering its install cost by 1credit, then shuffle your stack. If that program is still installed when your turn ends, remove it from the game. If the Runner plays Scavenge to trash and reinstall the program installed with Kabonesa Wu, do they still have to remove that program from the game at the end of the turn? No. After the program is uninstalled, it is considered a new copy of that card. If the Runner uses Kabonesa Wu to find and install a Chameleon, what happens at the end of the turn? Both Chameleon's ability and the delayed conditional ability created by Wu meet their trigger conditions at the same time. Since the Runner controls both abilities, they can choose the order in which to trigger them. Once Chameleon is uninstalled by either ability, the other ability will not be able to find it anymore. Thus, the Runner can choose whether to add Chameleon to the grip or to remove it from the game. Draw neither a Scavenge or Mopus in your opening hand. Use her ability to tutor an SMC and install Mopus. If you have to click for 2 then you can end turn 1 at 2, if you have a Dirty Laundry/Easy Mark or Sure Gamble to play click one, you can end turn 1 at 5 or 6, respectively. This works out the same if you draw an SMC in your opening hand. Assuming a 45 card deck with 3 Mopus and 3 Scavenge, you have around a 50% chance of hitting either scenario 1 or 2, (I think, it's been a while since I calculated probability). If you have 6 econ events you can play turn 1, then you have a similar chance of avoiding the 2 outcome of scenario 3. So originally I, and others I believe, were excited about Kabonesa with Scavenge. This is actually not a very good interaction. If you want to install a Magnum Opus with this combo you will need the following: A Magnum in hand or your heap, Scavenge in your hand, and a Magnum in your stack. 1 to activate Kabonesa and install the Magnum, spending 4 - 1 to Scavenge and install the second Magnum. If you then use Magnum twice, you'll end your turn with the same number of s you started with. Whereas if you just install it directly from your hand, and then use it three times, you'll end up with one more credit than you started with. Same goes for installing high cost programs like Femme. You need the necessary cards in hand/heap/stack and you'll only save one versus hard installing it; this while spending an extra . So Scavenge isn't really a great card for her. Chameleon is of course a nice interaction as it can avoid the "remove from game" clause. But this will only happen probably three times a game if you use three Chameleons. But that is about it. The only program I can think of that you only need for one turn is Cache, but that is not a valid target. So to me, her ability has significant limitations. But the ability to find that program you absolutely need right now and install in at a discount in one can save you the game sometimes. Now there is one other interaction which seems to be pretty solid to me. Using Kabonesa with Brahman. Brahman will continually send your programs back to your stack where it is a pain to pick them up and reinstall them. Kabonesa will save you time and money so you can keep your Brahman fed. Using Brahman as your main breaker with a few cheap programs and The Personal Touch as backup might work quite well. Throw in a D4v1d too. Everyone else has spoken already, but I want to join the praise. Kabonesa is very fun, very different kind of shaper -- regardless of her overall power (which seems high to me, but what do I know). Her innate, self-destruct-discount-tutoring opens up a range of cards that were previously seen as pretty unwieldy. While Self Modifying Code is obvious and an old standby, Customized Secretary gets a turn as a killer-ish app -- it's 1 credit! As others have identified, Origami and Ekomind have a reason to exist. This also might allow her to use some of the specialty breakers from Terminal Directive ( i.e. Adept and Savant )that require excess memory. Alternatively, she works well with her console Daredevil as 2 card infusion when running big servers can help get events into your hand. Otherwise, my challenge with Kabonesa memory limits when trying to install the trashable programs that install the programs you actually want -- although this can be overcome with careful planning. So she's good at setting up -- but to be honest, many Shapers are good at that. What I have found to be so interesting about her is the speed at which she can recover. In a recent game, I wiped my whole rig out stealing a pair of Degree Mills. Next turn, after I summoned a Customized Secretary from my stack, I was back up and running. I feel that this supports her flavour/feel of a fast moving thrill seeker. If everything blows up on a run, oh well, I'll worry about that next turn. This review isn't an actual analysis - I believe the other reviews sum up Kabonesa's potential quite well. 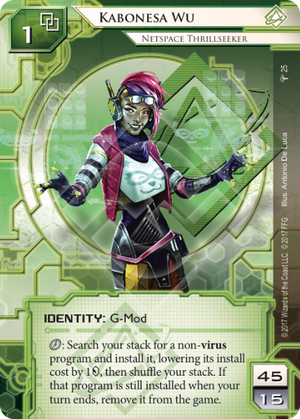 What I do want to point out is the return of the "Panda Perpetrator" (yes, I just made that term up) we first saw in Record Reconstructor and then Data Breach and that we get to see again in the spoiled card Because I Can from Kitara's 4th datapack The Devil and the Dragon. What is the story behind Kabonesa and her animal alter-ego? Is it as black-and-white as NBN will make it out to be? And the most important question of all, when can we expect Princess Space Kitten??? Kabonesa Wu is literally wearing the cat on the coffee mug from Record Reconstructor. Okay...the eyes on the coffee mug are open, but still! Backstory flavor ideas? Have we finally gotten the Princess Space Kitten ID we've all been waiting for?!! !